Pirate goal keeper Xavier Stalkfleet kicks the ball down field. Lady Pirate Ashlee Howell takes a shot on goal. 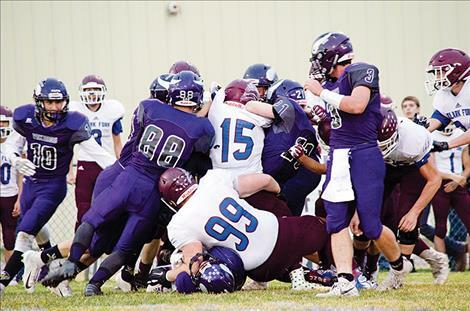 Pirate Bridger Wenzel races past a Bigfork defender. 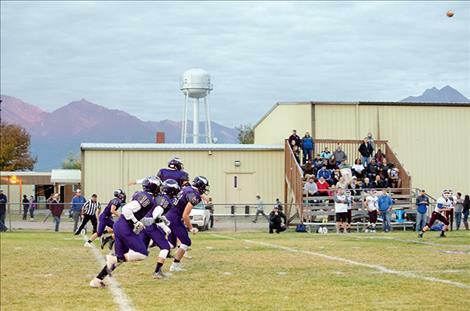 Charlo Viking football players and Clark Fork Mountain Cat football players come together during Friday night's homecoming game. 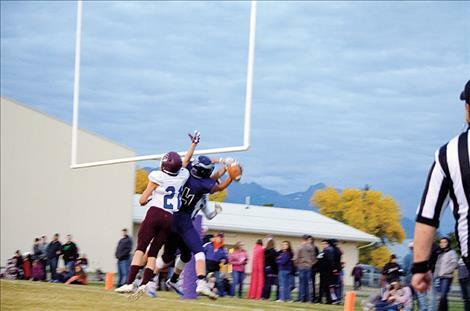 A great Vikings' catch precedes a touchdown during Charlo's homecoming game. The Charlo Vikings move the ball down the field with a high kick. Trapper McAllister, number 5, of the Ronan Chiefs, throws a pass during the homecoming game. 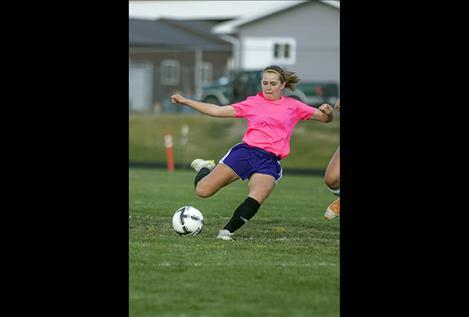 September 25, the Polson Lady Pirates prevailed over the Bigfork Valkyries 6-2. Both Ashlee Howell and Sophia Moderie found the back of the net twice, while Ali Hupka and Grace Hobbs each scored a goal in the home win. 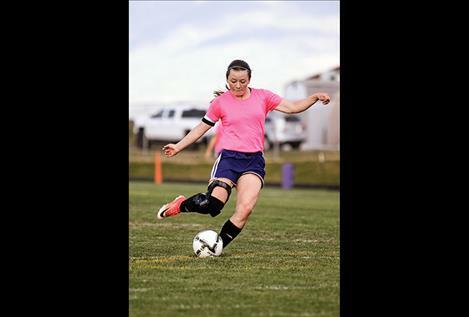 Sophia Moderie and Ashlee Howell each netted goals as the Polson girls’ soccer team defeated Columbia Falls on the road 2-1 on Saturday. Keep Kalie Finkbeiner had nine saves on goal for the Lady Pirates. The Polson Pirates had 12 shots on goal during Tuesday’s, Sept. 25, 8-1 home win over the Bigfork Vikings. 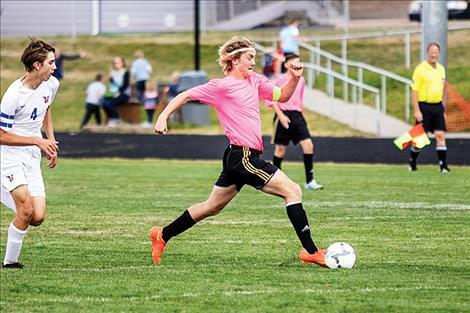 Mack Moderie led the Pirates with four goals, Robin Erickson netted two goals, and Bridger Wenzel and Kaden Nelson each added a score. 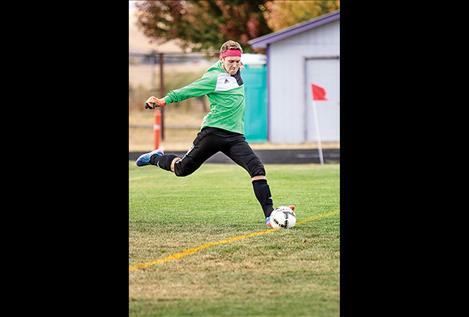 On Saturday, Mack Moderie scored two goals, while Erickson scored another for the Polson Pirates in a 3-0 against Columbia Falls on the road. Polson High School Golfers Matt Hobbs and Cali Cannon earned all-state honors during the Class A state golf tournament at the Hamilton Golf Club on Friday and Saturday. Hobbs carded a 74-71-145 total to share a four-way second-place tie in the boy’s individual standings. Cannon shot a 92-94-186 total for an eleventh-place finish to lead the Lady Pirates in the girls’ individual race. In the team competition, the Lady Pirates finished with an 822 fifth place showing, while the Polson boys were seventh with a 685 total. For the Ronan Maidens, Madyson Running Crane was the top golfer with a 112-116-228. The Arlee High School boys and girl’s cross-country squads earned one of their best team finishes of the season during their home event on Tuesday, Sept. 25, when they both took third at the Hatchery Challenge. Top finishers for Arlee were Cheyenne Pablo at sixth and Billy Fisher at seventh. Charlo’s Wills DeGrandpre’s (18:08) first-place win and Connor Koening’s third-place finish helped the Vikings capture the boy’s team title. Aryal Love placed fourth and Guinevere Contreras finished fifth to lead the Lady Vikings. Top finishers for Mission were Aidyn Rosenbaum at sixth place, Madyson Currie was seventh, and Yvonne Baty placed eighth. Two Eagle River top finishers were eighth-place Anthony Charlo and 12th place Mara Parizeau. Kaitlin Cox had 11 kills, 20 digs and eight aces as the Lady Vikings swept the visiting Drummond Lady Trojans in straight sets 25-11, 25-12, 25-15 on Tuesday, Sept. 25. Bella Hawk added 10 kills and Teaira Truman had 25 assists for the Lady Vikings. On Tuesday, September 25, the Mission Lady Dawgs fell in straight sets 25-17, 25-16, 25-9 to visiting Florence Lady Falcons. Addison Arlint had four kills, six digs and a block, while Hunter Eichert had 10 assists and a block for the Lady Dawgs. The visiting Libby Lady loggers toppled the Lady Pirates 25-17, 25-11, 25-13 on Thursday evening. Mikaela DuCharme led the Lady Pirates with five kills and 21 assists. Grace Quinones added 11 digs. On the road Saturday, the Lady Pirates battled in a close 29-27, 27-25, 25-22 against Butte Central. In the non-conference Class A matchup, DuCharme led the Lady Pirates with eight kills and five aces. The Maidens fell on the road in straight sets 26-24, 25-19, 26-24 to Stevensville on Saturday. Madeline McCrea floored 11 kills to lead the Maidens. Pirate running back Corbyn Lund rushed for 32 yards on seven carries and a touchdown in a 62-20 road loss to Libby on Friday evening. 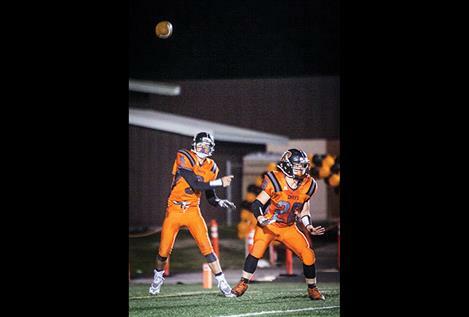 Junior quarterback Bo Kelley threw for a touchdown on 107 passing yards in his first game back from an injury that sidelined him for the majority of the Pirates’ season. No scoring or game statistics were available.